Visit our joint website www.dydo-haire.com for music and more information. Involvement with music has been important to Susan in the past and this has invested her exhibitions with an unusual dimension; she has collaborated regularly with composers, poets and a playwright. 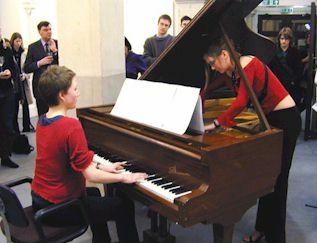 In each show performances have taken place in front of the paintings and recordings of music, written in response to the paintings, have been played throughout the exhibition. While listening to the sound clips below you may like to go to the exhibition pages to look at the relevant paintings - there is a text link back to this page in each case. Concert with 12 cellos and voices devised by Ethan Merrick. Motets for Pentecost by Tallis, Victoria and da las Infantas. Concert by Stephen Dydo from New York who visited the UK especially to give this performance in Susan’s exhibition. The linear form of the dance in the paintings has an affinity with the single melodic line of qin music. Music for qin has always been regarded as the expression of the variations of a line and traditionally qin players would also have been calligraphers.The qin (pronounced ‘chin’, also called guchin) is a seven-string plucked instrument with no frets and the sliding-notes, harmonics and vibrato create a complex, flexible and expressive, yet deeply meditative musical style. 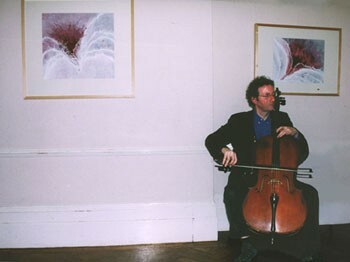 Stephen played classical Chinese qin solos on silk strings, then metal strings and finally on the electric qin, for which this concert was the UK premiere. 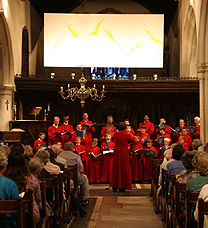 A concert of works written in response to the Holy Spirit by Tallis, Gibbons, James MacMillan and others conducted by Andrew Reid, Director of Music at Peterborough Cathedral, who co-founded The Shoreham Festival of Music with Susan in 1991. Visitors to the exhibition are invited to observe and engage with Susan as she works on paintings in the church over five days. While Susan is painting in the church Danny Kingshill and Livia Sevier will improvise together with voice, cello and tampura. Series of four sessions of improvisation with voices and musical instruments led by Danny Kingshill. 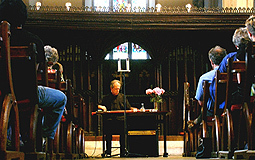 A series of four meditations and discussions inspired by the paintings led by Rev. Richard Freeman. Local schools’ workshops with Susan. The children will work on the floor of the church and have the opportunity of pouring and flicking paint. Concerts of music written for the collaboration as a part of Sounds New, festival of contemporary music. Sea Change by John Pell, Fear of Change by Paul Terry, Tone IV by Andrew Gower, And then there was light by Stuart Duncan and Sea Change by Stephen Clee, directed by Paul Edlin. 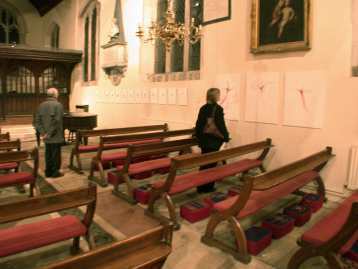 The Reverend Richard Freeman, Vicar of Shoreham, initiated Passion as a major project for Lent, inviting Susan to make paintings for Shoreham church. He collaborated with her through discussion and led meditations on Passion as part of a weekly series of events that was presented in conjunction with the exhibition and which offered a challenging approach to our reflections on the Passion. Andrew Reid, Sub-Organist at Westminster Abbey directed two concerts on the theme of the Passion. In tenebris, music for Holy Week, included works by Tallis, Victoria, Guerrero and Morales and was the first performance given by Incipit, a professional six-voice men’s choir founded by Andrew. Handel’s Messiah (parts II & III) was directed by Cambridge undergraduate Geoffrey Paterson with fellow students as choir and soloists. Jane and Danny Kingshill presented an evening of readings of Jane’s poems with music and improvisation for cello and voice. Two poems are included here: THE LECTERN and THE NAVE and its hangings. Trinity College of Music and The Stephen Lawrence Gallery are both situated in The Old Royal Naval College, Greenwich. So when Susan was planning Placentia she approached Trinity in the hope of collaborating with female composers and this resulted in Mind and Body for piano, two clarinets and CD written and performed by Sarah Scutt and Johanna Olsson. Jane presented a reading of Poems for Placentia with semi-improvisation by Danny and once again he joined the meditation led by Karen, improvising in front of the paintings. Chris gave a piano recital and performed his Fire and Water and Colours of Lentua by Nils and a selection of their works from past collaborations. The recital was interspersed with readings by local poets led by Ted Walter. Katie wrote the play, Through Hell and High Water, produced by Kevin Robinson, which was aimed mainly at school children and irreverently explored the history of Hall Place. There was a poetry reading given by Jane of Consequences accompanied by semi-improvised music by Danny. The Rev Karen Best led a meditation with improvisation by Danny weaving around her speaking and the silences. A concert in celebration of collaboration was presented for The Painted Veil: Chris wrote two pieces including Soliloquy which he played alongside music by Nils. Katie wrote the ballad Three Ghosts to honour collaboration which was set to music and performed by Danny who also performed a semi-improvised musical setting of Jane's poems. The two events in Constellations were part of the Rye Festival. Chris gave a recital of music for piano which included his Six sonatas in the style of Scarlatti, sonatas by Scarlatti and Soundscape (Chain) by Nils. Jane wrote the collection of poetry entitled Shooting Stars and she, Danny and Robin presented an evening of musical setting of the poems for Incandescence. 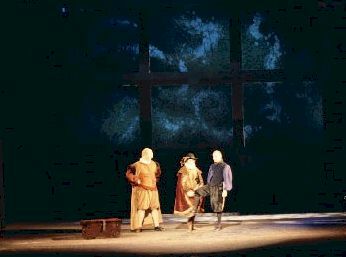 On the opening day of Escapes, in Cheltenham, three performances took place one after the other. Chris gave a recital performing music for piano written by him and Nils and other composers. This was followed by a poetry reading by Jane with Improvisation for Escapes by Danny (click on title for an extract - 1 min 8 secs; filesize: 267KB). It is through improvisation for 'cello and voice that Danny has collaborated most closely with Susan. 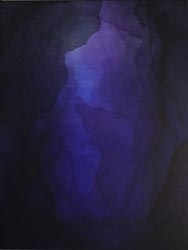 He has improvised in response to the paintings in front of audiences and also in Susan's studio where he made recordings (produced by Jonathan Histed) beginning with Escapes. The day of performances in Cheltenham culminated with the play, An Extraordinary Talk on Masques, a dramatic entertainment written by Katie, performed by Cyclops Productions and directed by Kevin Robinson. Cyclops, formed by Katie for professional actors working within a small group, aims for public recognition of disabled artists on an equal level with their non-disabled colleagues. performed at the Cochrane Theatre, London. which were suspended above the stage throughout the performance. Another choral concert by Temenos included a ballad, The Wood at the World's End, written by Katie and set to music by Danny. Edmund Jolliffe was joined by Michael Oliva in composing recordings of electro-acoustic music for the exhibition. Wide Time was the first collaboration between Susan and composers Nils Schweckendiek and Christopher Willis as well as: poet Jane Kingshill; composer, musical improviser, 'cellist, singer, keyboard player and actor Danny Kingshill; and playwright and songwriter Katie Kingshill . Since then they have all collaborated regularly with Susan, writing for and giving performances in almost all of her exhibitions. Among the numerous events that took place in Wide Time was a piano recital given by Chris which included his Rituals for piano and Three by three on five by Nils. They also wrote choral pieces for a concert given by Temenos, an early music choir originally founded by Susan. Jane presented a poetry reading with a group of poets and Danny wrote and performed music for the occasion. 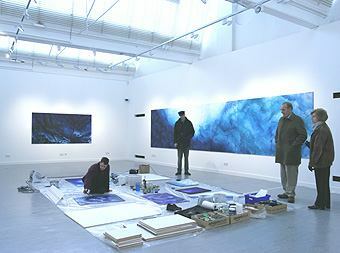 Chris, Nils, Danny and Edmund Jolliffe made their first recordings for the collaboration, to be played in the gallery. It has been impossible to avoid this web page being so long even though a full list of performances and works has not been included. If you would like any further information please contact Susan..